Chau is an excellent guide. Our tour was well paced, enjoyable and informative. He provided detailed information about the history of Saigon/Ho Chi Minh City and it's religions and cultures. At our request, and at the last minute, he arranged for an air conditioned van and an excellent driver for a reasonable additional fee. Well worth it given the heat. We enjoyed our half day with Chau and highly recommend him. We had a wonderful tour with our excellent tour guide Chau. He tailored the tour to our needs, spoke very good English and was very knowledgeable. He made sure we were comfortable with what we did, advised us on purchases and food and told us lots about the country and way of life. I can thoroughly recommend the tour with this pleasant, friendly young man. Had an excellent day with Joe in HCMC, highly recommended. Chau's tour of the Mekong was spectacular. Not only did we get to visit the Cai Be floating market, but we were also given a private tour of the countryside on our bikes. Everything about this tour was fun and amazing, and is definitely different to any other tour out there. If you're going to the Mekong, use Chau's tour. We had an excellent tour of Ho Chi Minh City on the 24th of December. Everything went very smoothly - totally recommend - great value for money and so much better than any ship excursion experience. We did a private tour of Saigon with Chau. He customized the tour to include a cooking lesson. Chau asked us if we preferred home cooking or a restaurant lesson. We chose home cooking and were so excited when he told us that we would be cooking with his wife at their home. It was the highlight of our trip and allowed us to see some local culture that we wouldn't have otherwise. We can't wait to go back to Vietnam. I highly recommend Chau and this tour!!! Great 2 days off the beaten track, did so much, Mekong Delta is a truely amazing place and we were lucky to see it as we did - great tour guide and company for the 2 days, are some amazing stuff - thank you. Joe was a fabulous guide. He planned a great trip to the Mekong Delta including private boat to a floating market, market tour, rice paper demonstration, candy making. A highlight was a fun mini cooking class at a lovely home in the Delta. We were concerned because we had had some stomach distress and Joe asked them to cook us a special meal of rice and ginger chicken. The day was delightful! Joe's English is EXCELLENT and we strongly recommend his services. Chau Lee "Joe" was right there at the port when the six of us women got off the ship. No problem finding him. He has such a great sense of humor and his English was very good. He kept us on track which wasn't easy for him with 6 women. We all had a wonderful experience. I've have always taken ship excursions but after this, I will definitely do a Tours By Locals tour again. Joe and Ben did a fantastic job. We really enjoyed our day, the guys were very knowledgeable about all the stop and looked after us wonderfully. Thanks for the great day. Listening to his English needed some concentration at times but he was very informative about different subjects. He spent a lot of extra time with us and was flexible in complying with our wishes. We felt he could have been a bit more informative and attentive. He walked ahead of us quite a lot and seemed to be on his phone quite a bit, although often it was because he needed to call a cab which was necessary of course. He didn't take us to the Reunification Palace and one or two other essential sites so we felt we didn't get an overview of Ho Chi Minh City's past and present. He didn't describe or explain things as much as we would have liked. We did however enjoy the Eco village. Tries very hard, but needs to pick up information on some of the sights he took us to. Chau was an amazing guide. He was smart efficient and lead a great tour! We had an awesome time with him and worth every penny! Chau was terrific and really knows the city. He was very accommodating to all our requests. This was a great tour, and Chau is an outstanding guide. He is engaging and informative, and he could not have been more considerate of our wishes! He asked what we were (and were not) interested in seeing and tailored the tour for us. Highly recommend. Joe picked us up just outside the Phu My port gate right on time. There were 6 of us and the van was quite comfortable for all of us. Highlights of our tour were a visit to an old Buddhist temple, a local's food market (no souvenirs in sight), and a walk around the Colonial district. We had traditional pho for lunch and an iced Vietnamese coffee for a snack. It was a long drive from the port to the city center, so we did not have a lot of time in HCMC but we felt that we got a great overview of the city. 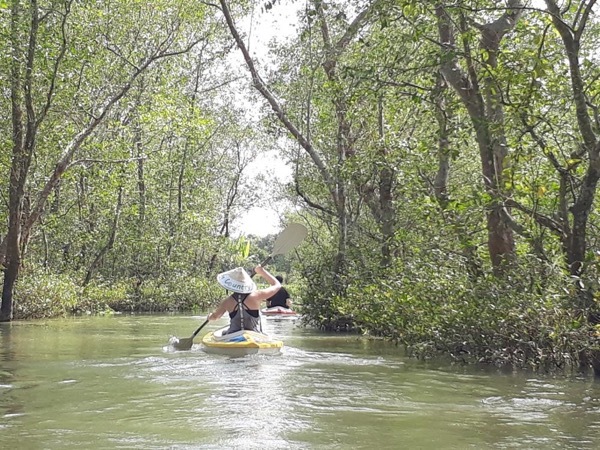 Great tour with biking and kayaking in the Mekong Delta Region! Chau showed us lot of beautiful places and new food to try The drive back to the ferry was quite tense but we made it eventually :) I would definitely recommand. TOUR GUIDE RESPONSE: Dear James, Greeting from Saigon city. Many thanks for your comment.I am glad to hear that you all enjoyed the trip. It was a great way for me to improve my services to serve people who would love to experience the real Vietnam. Your local guide Chau. Chau (known as Joe) met us on time in air conditioned spacious van equipped with bikes, kayaks and plenty of water. We had asked to go off the beaten track and see the real Mekong and we were not disappointed (saw only 2 tourists in 3 days). He was knowledgeable on local wild life and fauna and showed us how to crack coconuts and and make spoons from the shell. Plenty of cycling, boat trips and when 1 kayak broke he soon requisitioned a local sampan to fill. If you want adventure, Chau has it. Joe drove safely and had things nicely arranged with boat drivers. We were surprised that lunch was an extra charge as it had been listed in our itinerary. Joe was a nice guy but did not appear particularly engaged or passionate about sharing information. He answered questions we asked openly and clearly. Chau was our guide during our two days long visit to the Mekong delta. Chau was a wonderful guide. He was good at adjusting the activities and the journey along the way to our needs and wants. That is what you wants from a guide when traveling with children! Chau took us to fabulous dining and accommodations, which we never would have found on our own. He shared his knowledge of the area in a really interesting and pleasant way. We will definitely use Chau again next time we go to Vietnam. We had an AMAZING day! I am not a big Kayaker so Chau Le (Joe) added a seat to his and we doubled. My husband had his own. We got to take a look not only at the Mekong River markets (much was closed b/c of Tet - Chinese New Year) but also the back streams and passages. We were a site to see and many local children AND boaters really gave us looks! We had a gorgeous - fresh lunch at a lovely riverside restaurant. We then had a another cruise before heading back. It IS a long drive - but worth it! We had a blast, guides are very friendly and we felt safe on their motorbikes!!! It is a must to fully enjoy visiting Saigon! Excellent day out with Chau. He tailored our itinary to suit our request. We wanted to some cycling and vist Cu Chi tunnels and Chau arranged this, making sure the cycling was not too streneous and ok for my 9 year old son. Very friendly and knowledgable. Thanks. Chau did an excellent job arranging the tour for us throughout Ho Chi Minh and the Mekong Delta. He knows some amazing out of the way places to guide this tour. The van he provided was large, air-conditioned, and comfortable for our group of four. The bike ride through the villages and the kayaking were much fun. TOUR GUIDE RESPONSE: Dear Martha, Many thanks for your feedback. Iam very happy to know that you guys enjoyed the trip. I am an adventurous guide so that I made some tours like on other. Wishing you happy life All the best from Vietnam Your local guide Chau L.
Joe was an amazing guide! We were two families traveling together with children (ages 14 and 17). Joe planned a trip that incorporated everything we wanted from biking to kayaking and eating at local "off the beaten path" restaurants. Some of our favorite activities were the motor bike food tour (a must!! ); singing karaoke with the college students who drove the motor bikes; trying local foods; exploring the Mekong Delta; floating villages; fishing; snorkeling; and many more adventures! Thanks Joe!!! My family and I are world travelers. Have been to 30 countries. Chau is in the top 3 for sure. He was amazing. We were not just clients to him. We were humans. He made us feel like we were old friends visiting him again. I highly recommend Chau to all of you going to Saigon. We designed our own custom tour with Chau and he went above and beyond what our expectations were. He is just the best at what he does. TOUR GUIDE RESPONSE: Dear Wade, Many thanks for your comment and I am happy to hear that you guys enjoyed the customized trip. Yes.. I want to do something unique from the rest of the others... Once again, thanks for everything and keep enjoy your life. Your local guide Chau L.
We have only good things to say about this well-designed, informative, active tour of Saigon's suburbs and countryside. The bicycles are new (Trek brand), and helmets are provided. Joe, our guide, was prompt, professional, engaging, and kind. Cruise ship passengers: if you can cycle 30 km on level ground, skip the big-bus tour, and choose this one! We had the most fantastic day with Joe and his colleagues. Their organisation, local knowledge and friendlyness was brilliant. We would absolutely recommend this tour to anyone. Well Done Guys. Everything was perfect. We had a great time and loved the personal attention. The vehicle was clean and the air conditioning worked great. I'd highly recommend this service again in the future. What a wonderful day we had. Chau (Joe) planned our whole day trying to get everything in. Compared to the cruise ship we do four items to one. I think our best pictures will be from Vietnam since everything was so different then other places such as sanpan boating to a ride on back of a horse drawn cart. Trying all the fruits with tea and singers. Joe, you are a fine wonderful gentleman, keep up the good work making people happy..The very best to you and your family. Fantastic tour! Great guide with a very authentic tour of the Mekong delta. Did not feel like a touristy tour. Great feel for local culture. Met amazing people along the way. Delicious lunch included. Highly recommend this tour. We took a two day tour with Chau. He did an outstanding job guiding us through Saigon and the Mekong River Delta. His English is excellent.He went beyond showing us the tourist attractions by also showing us life in the villages and back country. We visited a number of villages and interacted with locals there. His grasp of the culture and history was also a big plus. I would highly recommend Chau. Chau was a great guide for our two days in Saigon. He is extremely knowledgable about history, economics, politics, etc. He is also flexible and makes good suggestions. His command of English is excellent. We definitely recommend Chau for your tour! Joe is a very good guide which let us experience the night life of Saigon and country side for City dwellers like us especially my kids (12yrs and 6 yrs old) who play nothing but iPad . This trip let them see the local life in the country, give them knowledge on the Vietnamees war . Excellent tour. Wonderful way to experience Viet Nam. Joe does a great job, the bikes are well maintained, and the people we met were friendly and happy to interact with Americans. Biking to the tunnels was a great way to experience the countryside. Joe does a wonderful job. Highly recommend. Informative, friendly, fun, adventurous, and good at listening. Driver was very helpful too. Really listened to our interests and needs. Great energy. TOUR GUIDE RESPONSE: Dear Linc Jackson, Many thanks for your comment. I am very happy to hear that you both enjoyed the trip. It will be a strong motion for me to develop my job. All the best. Your Local Guide Chau L.
Chau was a wonderful guide and host during my Saigon After Dark on a motorbike tour. We visited five different establishments serving a range of local delicacies, each very much off the 'tourist' beaten track. At my request at the time of booking, Chau added a local club as our final destination which was a fun way to end the evening. I felt very safe riding with Chau who expertly navigated the chaotic and rain soaked Saigon roads. A great night! TOUR GUIDE RESPONSE: Dear Lynda, Many thanks for your great comment. I am very happy to show you the Real Saigon city and glad to hear that you had enjoyed the tour. Wishing you a great bkie trip... All the best from Vietnam. Your local guide Chau L.
Chau was a great tour guide. We did a motorbike tour of Saigon with him on Saturday 14th June. Chau was happy to amend the itinerary to suit some places we wanted to visit. He was entertaining, knowledgable and helpful. All in all a great day out. Thank you! Chau was a great tour guide....met our family of 5 at the airport and gave a really good tour. You can tell he has a passion for his Country, and was equally passionate about sharing it with us. I remember from the first moment, when he needed everyone to move on...he always referred to us as "my family" very nice. Chau is also teaching English at the local University, and he offered an evening "progressive dining" tour on mopeds. We LOVED it! He had 5 students, one for each of us..YOU MUST DO THIS. TOUR GUIDE RESPONSE: Dear Tim and Family, Greetings from Saigon,Vietnam. Many thanks for your great feedback. it is a strong motion for me in my career. Once again, thanks for choosing me as a Local guide in Saigon, Vietnam. Your family always in my mind... I will see your FARM one day...:)) All the best from Veitnam. Chau L.
Great fun, knowledgable and creative in planning a memorable trip. Chau was available on very short notice and organized everything perfectly. The best of all the tours. Most knowledgeable tour guide ever. Guide did not prepare prior to pick up of clients therefore arrived at the wrong location and consequently tour departed late and also was unable to deliver the tour that was requested. TOUR GUIDE RESPONSE: Sorry about the mix up concerning the pick up location. Your ship had arrived at Cai Mep port but you said pick up was at Phu My. The delay did cause us to miss part of the tour. I'll be sure to verify the arrival port in the future. TOURSBYLOCALS RESPONSE: Ho Chi Minh City is served by 3 ports - the ocean ports of Cai Mep or Phu My and the river port of Ho Chi Minh (smaller ships only). We're working with the guide on a means to check which port is the correct one so as to avoid future problems. We had 2 great tours with Chau Le. First we went down the Mekong and the next day by speed boat to the Cu Chi tunnels . On both tours he was a great guide. He was informative, friendly and arranged everything for us. He gave us an insight into local customs and Vietnamese ways on our tour to the Mekong Delta. And his cooking of lunch was good too! A fantastic guide. Thank you for so many wonderful memories Joe. Chau was the best guide we have ever encountered . He made our stay in Viet Nam a once in a lifetime experience . Perfection!